Why do people love the Instant Pot so much? Speed. The Instant Pot is about cooking food faster than it would be using other methods. That’s the power of pressure. 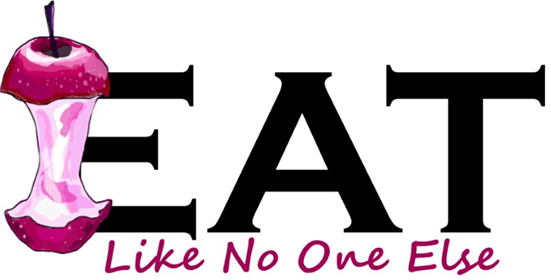 It’s ability to increase the boiling point of water, cooking food faster. Think of anything you boil. Would it be better to do in the Instant Pot? Let’s explore one food today that is often boiled – potatoes. And why are they boiled? Well for mashed potatoes of course. 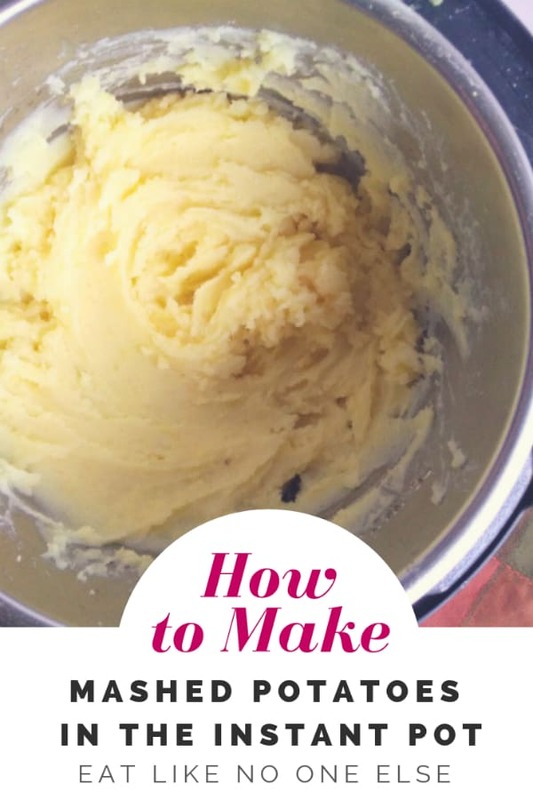 In order to make mashed potatoes in the Instant Pot, there are a couple things to consider. You don’t want to overcook the potatoes and make them water logged. The downside about using an Instant Pot, is that you can’t as easily check on them as you would if they are boiling away in a pot. For 3 pounds of potatoes I would recommend cooking them no more than 10 minutes. That is how long I did mine, but I probably could have gotten away with doing them at 8 minutes and be perfectly fine. It can vary based on that potatoes used and what size you cut them. You don’t need to completely cover the potatoes. Next thing to consider is your water. You don’t need to drown the potatoes in water. The more water you add, the longer it will take to come to pressure. What I did was cover the potatoes about half way or 3/4 quarters of the way with water. You don’t need to completely cover them. All of my potatoes were cooked, even the ones that weren’t completely covered at the top. If you use more water it will also take longer for the pressure to release unless you do it manually. Some of the time I shy away from manual release, especially something that is starchy as I don’t want starchy steam sticking all over my kitchen. 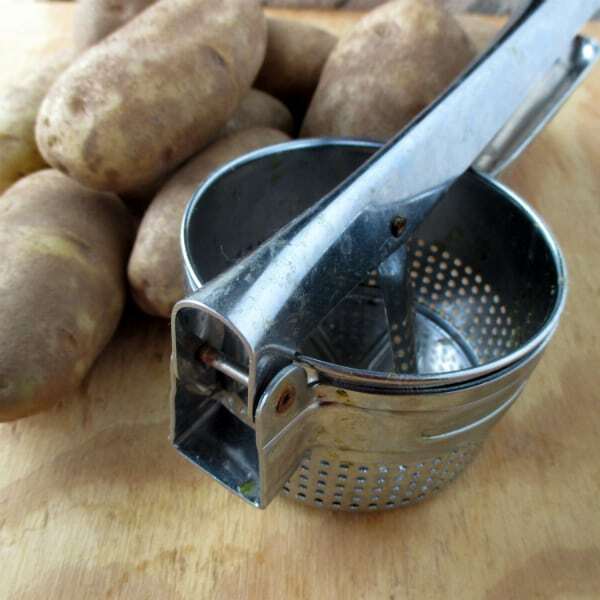 A potato ricer can help you smooth out your potatoes. In the past, I have talked about potato ricers on this blog. They are your friend. By taking the time to put your potatoes through a ricer you break them down and keep them from getting gummy – we aren’t making bears! If you don’t have that is fine. Just don’t work the potatoes too much. You can whip them quickly with a hand mixer if you want. The ricer also helps remove the skins if your not a fan of peeling potatoes. This is what the potatoes look like once they go through the ricer. 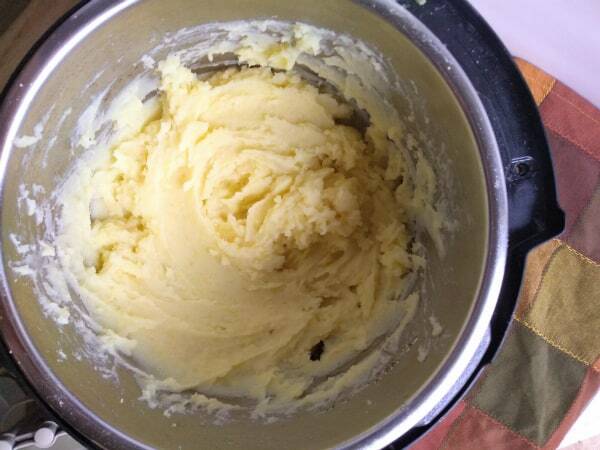 Here is the absolutely beauty of cooking mashed potatoes in the Instant Pot – you can keep them warm. 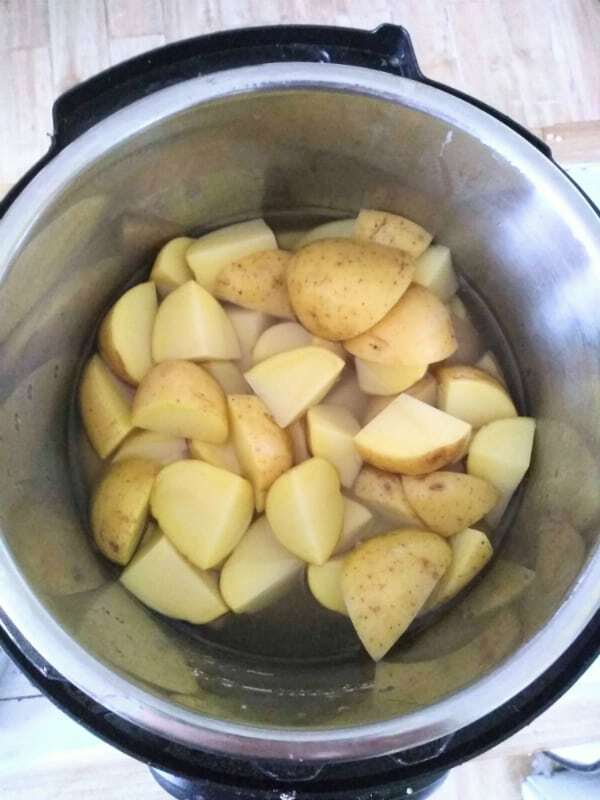 It’s much easier to keep potatoes warm in the instant Pot than on the stove. You can finish them ahead of time for your meal and then just have them on warm, ready to serve without having to dirty another vessel. This is the kind of thing it would be helpful for to have the Instant Pot glass lid. It’s easier to remove than the Instant Pot lid when it comes time to serve the potatoes. These potatoes get their yellow color from Yukon or Gold fleshed potatoes. 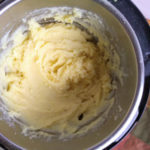 Gold or Yukon gold potatoes are really great for making mashed potatoes with. They have a beautiful yellow inferior and give the mashers a buttery taste. I normally don’t use Russets or baking potatoes unless I am making my No Peeling Necessary Mashed Potatoes. RELATED Can You Cook Turkey in an Instant Pot? I hope you give these mashed potatoes a try. 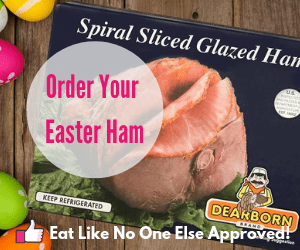 If you do, leave a comment below and let us know how it worked for you These would no doubt be a time saver on Thanksgiving. 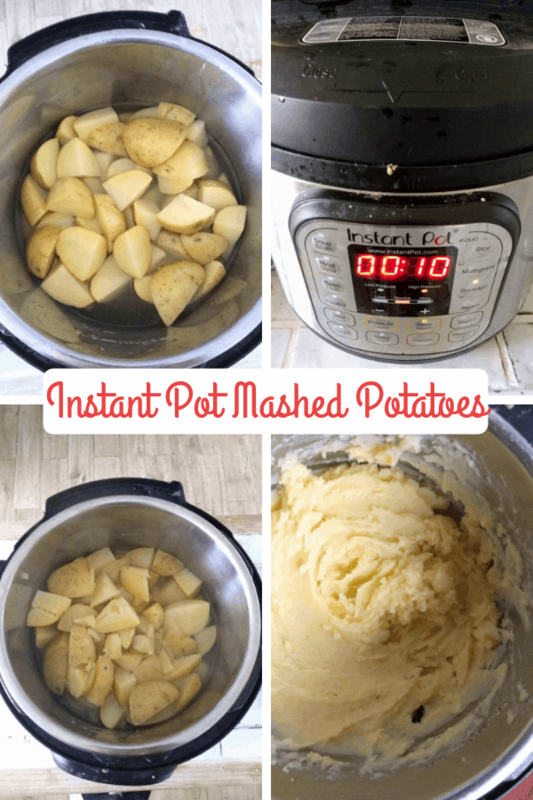 Learn how to create mashed potatoes in the Instant Pot. Place your quartered potatoes in the Instant Pot. Add enough water to come up the potatoes 1/2 to 3/4 of the way. Seal the Instant Pot and cook at high pressure for 10 minutes. Allow for natural release. Drain the potatoes. Then place them back in the pot. 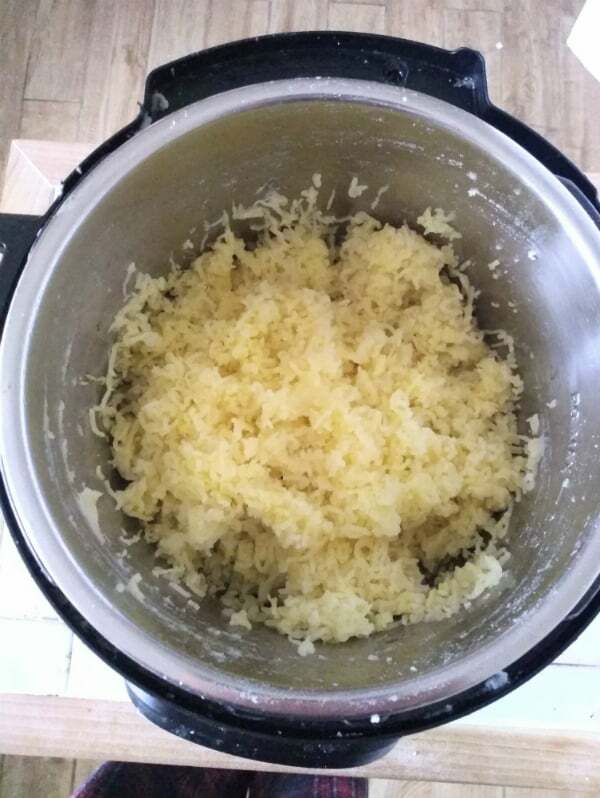 If using a ricer, run the potatoes through that first. If not using a ricer, mash the potaties with a potato masher or back of a wood spoon. Add butter and salt to taste. Slowly add in the milk, only using what the potatoes need. Using a hand mixer or a whisk to just combine. Don't overwork them. 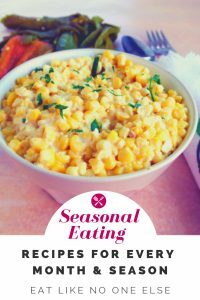 Set the Instant Pot to warm until ready to serve. Previous Post: « Can You Cook Turkey in an Instant Pot?